I love this simple preparation for barbequed mackerel. A fish that cooks so well over the hot embers of an open fire. Because of its oily flesh, it’s particularly resilient, even in the hands of the inexperienced fish cook. Here I’ve spiked the skin of the fish with toasted, cracked fennel seed, lemon zest and chilli, three flavours that work so well with the tang of lightly charred fish skin. I love to set a few small branches of bay around the fish which smoke and crackle is it cooks, perfuming it beautifully. Meanwhile prepare your mackerel by gutting them, If they haven’t been already, and wash them briefly under a cold running tap. Use some kitchen paper to pat the fish dry inside and out. 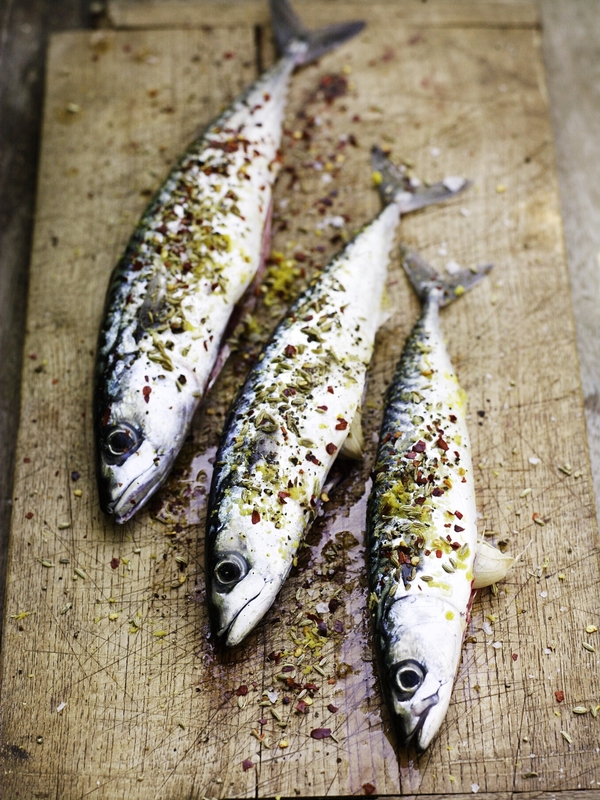 Lay the fish on a board or plate then rub them with the olive oil and season well with salt and pepper. Scatter over the chilli flakes, crushed fennel, and lemon zest give it a gentle rub so it sticks to the skin of the fish. Set the grill over the barbeque and when hot set the fish down on it directly over the high heat. If you have the bay, lay this around and in-between the fish too. Cook for 5 minutes then turn them over and continue to cook for a similar amount of time, or until the mackerel flesh just lifts from the bone.